After the excitement of the finds off Mozambique and Tanzania in recent years, the prospectivity of the east African coastline has had a reality check following the outcome of the Mbawa-1 wildcat operated by Apache. Source: IHS Located in the 5,123 km2 Block L8 in the Lamu Basin, the well was drilled in 864m of water using the Deepsea Metro 1 D/S. In an interim update, Apache said that it had encountered 52m of net gas pay in Cretaceous sandstone, the primary target. The well reached a total depth of 3,151m to test for any deeper oil potential within this gas-prone region but no hydrocarbons were found. Nonetheless, even though the Cretaceous gas is deemed non-commercial, the well is claimed by the consortium as the first hydrocarbon discovery off Kenya. The Mbawa structure is described as a large but complexly-faulted anticline mapped on 3D seismic data with potential for both oil and gas at inferred Tertiary/ Cretaceous and Jurassic reservoir levels. Apache said in July that the Mbawa well is likely to strike oil based on seismic data and slicks seen on the Indian Ocean’s surface and that the drilling targeted as much as 700 MMbo. 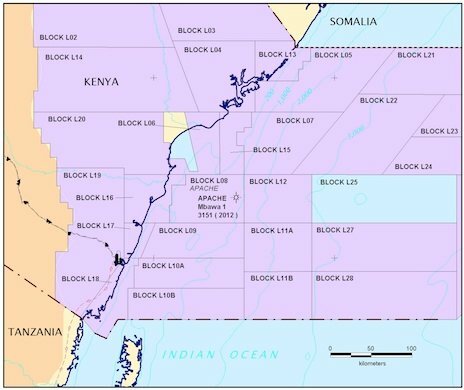 Block L8 interests are held by Apache (50%), Origin (20%), Pancontinental (15%) and Tullow Kenya (15%). As is well known, shale gas and other unconventional resources have revolutionised the hydrocarbon industry in the US, and the country is expected to become a net exporter of gas by 2020, according to the EIA. What is the significance of this for global energy?